These telephone entry systems automatically dial a predetermined number when pressed. The user does not control who will be in charge of granting or denying access. Devices can vary on certain features such as optional proximity card readers, handsets, weather mounts, etc. 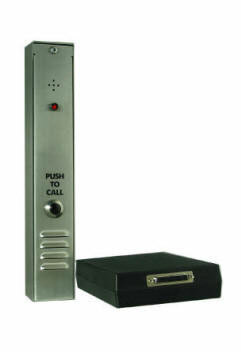 A hands free single button phone auto dialer with major applications in industrial/commercial access control. Once the “call” button has been pressed, the device dials a primary telephone number (indicated by the call progress light). Entry can be granted when the called individual presses “0” or visual identification with a camera can be activated by pressing the number “9”. If the call happens to go unanswered, up to 9 backup numbers can be saved on the device. Seperate RF remotes can also be added for easy entry. This mini telephone entry unit is a single number autodialer. When the button is pushed, the unit begins dialing. The unis is normally 12 VAC powered, but will automatically transfer to phone line power if the utility power fails. The person who answers the call then takes control of the relay. The relay is then used to remotely control entrances, lights, cameras, etc. Flush mount plate mounts to a standard 2 Gang box. One 24 digit resident telephone number. One normally open/normally closed 5 amp form C relay. Low noise Microphone housed in a shock resistant chamber for enhanced reliability. Programmable ring count, gate time, call time, and gate opening tone. Normally 12 VAC powered with phone line power backup. Will run continuously on phone line power, but will not close the relay. Red flashing and steady ADA light. This design is perfect for glass front entries, because it fits perfectly on the metal window frame for a clean installation. Works similarly to the standard auto-dial phone entry system, except it is currently only available as a surface mount. A hands-free single button telephone auto dialer used as a stand-alone entry host for RFID proximity access cards, through its 26-bit Weigand protocol interface card. Primary entry is executed through the RFID proximity reader that is serviced by the system’s microprocessor as a stand-alone entry host. Backup entry is executed by pressing the single call button to initiate the autodialing of the primary telephone number (indicated by progress light). If the number is busy or does not answer, the entry-phone will hang up and dial up to nine 'backup' numbers. This auto-dial telephone entry system includes a handset phone for access control in industrial/commercial high noise environments. Once the handset is lifted, a primary telephone number is dialed, and entry can be granted or denied.